Hi, this is first update LeEco Le 1s EUI 5.5.014S Stable Stock Rom and here is an easy and safe tutorial for install or update LeEco Le 1s EUI 5.5.014S Stable Stock Rom. Fixed Camera force to close under certain condition and updated camera temperature warning from 50 to 45 degree. Added LeLive, Added LeEco membership and fixed calender issue. Fixed Map and browser force to close issue. fixed video playback interrupted after unlock screen. System Power optimization and fixed typos for certain modules. Tie up with Yupp TV and now you can access to over 100 premium TV channels for sport, movies, music and many more. Step 1: Download LeEco Le 1s EUI 5.5.014S file and rename this zip file as “update.zip” like S1_x500-OS-OP-DHXOSOP5501405251S-5.5.014S to update.zip. Step 3: Go to “System Update App” from the system tool, tap on the setting icon, it is a 3 dots icon on top right corner (see in this image) and tap on the “Local Update” tab. Now you can see a message on your phone Screen, “Update package found, your phone will restart, are you sure to continue?”. See in this image. Step 4: Now Click on continue, your phone is going to reboot in recovery mode and Rom flashing process start. Don’t interrupt this process, it might to take 4-6 minutes for your phone to first boot on eui 5.5.014S. After update LeEco Le 1s EUI 5.5.014S Stable Stock Rom, you can root your phone because root allows you to use a maximum of your phone without any restrictions. After root you will install custom apps, Rom and custom setting in your phone. But first read Root Advantage and Disadvantage by this article, then here is a root guide: How to root LeTV LeEco Le 1s without PC. I hope you like this update LeEco Le 1s EUI 5.5.014S Stable Stock Rom installation guide from which you will be able to easily install or update LeEco Le 1s EUI 5.5.014S Stable Stock Rom without any extra efforts. If feel any problem in this guide then please use comment box. Thanks to all. 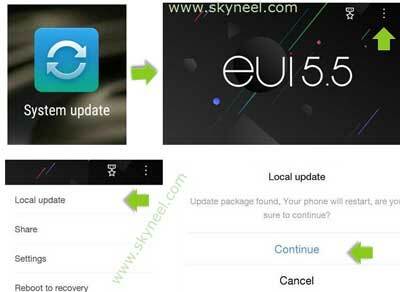 Hi neel mujko ye btao ki mera phn le eco 1 5.5 version p akdam thik chal raha tha phir abi kuch din pahle mere pass iska update version aaya …5.8 to mne isko 5.8 version m update kar liya…us din s m bhut parshan hu …..is 5.8 version m kuch b sahi s nhi chal raha h ….to ab m ye chahta hu ki mera phn phir s wo h 5.5 version m wapis ho jaye iska koi tarika h ki ye 5.8 version s 5.5 version m wapis chala jaye ..
my phone file manager menu open karne k baad application menu tuch kartahu to massage aata hai sorry but file manager has stopped report this issue now? you can reset and factory data on your Le 1s then you can flash marshmallow update and enjoy with marshmallow . here is no data loss but i advice you if possible you back up your data. How can I update my le 1s in marshmallow pls tell me frnds ??¿¿?? Hi my phone doesn’t restart after pressing continue. I have to restart it manually and it never update. Can you please help me. you can install this update using sp tools. i personally used this method its working bro. unroot your phone the try to update your phone.